The recent hue and cry has also implied there was something sordid or furtive about the “on the runs” scheme – that ministers might have bent the law or even ceded authority to Sinn Fein, allowing them to be judge and jury over these cases. Neither accusation is remotely true. But in order to get the historic 2007 devolution deal, I oversaw the final acceleration of this administrative scheme, which was operated by the police independently of the government, though it was overseen by government law officers. The process was as follows: Sinn Fein’s Gerry Kelly put forward the names of those who believed they might be unable to return to UK jurisdiction without fear of arrest. A PSNI unit then conducted a painstaking check on each one to see if there was any evidence to take forward an arrest and prosecution. The test applied by the Public Prosecution Service was not simply whether the evidential test was no longer met, but whether it could ever be met. No minister was involved in any case or knew the names of the individuals concerned. The letters were finally signed by an official in the Northern Ireland Office, but only after a second check showed that all was in order. The Attorney General also confirmed that “the system of giving an assurance to an individual that they are not wanted because they are indeed not wanted and there is no current basis for wanting them” was lawful. It was done, he said, “with the intention of taking the peace process forward, and done in a way that was not intended to prejudice, first, the rule of law and, secondly, the right of victims and relatives of victims to see justice be done”. Let’s put this whole business into context. I understand perfectly why victims of the Troubles felt betrayed when, following the 1998 Good Friday Agreement, more than 400 Loyalist and Republican paramilitary prisoners, many convicted of appalling terrorist crimes, were released on licence. But this was a key factor in facilitating the agreement. Yet there remained the anomaly of more than 200 Northern Ireland terrorist suspects “on the run”, completely outside the reach of our justice system, but possibly wanted for terrorist offences that took place before April 10 1998. All active republicans such as these had to sign up to the peace process to make it work. I introduced legislation in the House of Commons in 2005 to establish a legal process to address the matter. I did so reluctantly, but out of necessity for the greater good of peace. It made provision for those suspected of an offence to go before a Special Judge, and then released on licence, subject to not reoffending. Clearly Sinn Fein were only interested in their people, but I wasn’t having that. The legislation would also have to cover former soldiers who had stepped over the line in the execution of their duties – for instance, those involved in the 1972 Bloody Sunday shootings. Now, having asked for this legislation – and having been well aware of the contents of the Bill – Sinn Fein were then pressurised by the nationalist Social Democratic and Labour Party (SDLP) to withdraw their support precisely because I insisted that any such legislation must apply equally to members of the security forces. They all hated that, but I was never going to agree to exempt terrorists and not our soldiers, so I withdrew the Bill. Frankly, I was glad to see the back of it. That, however, still left the thorny “on the runs” issue as an obstacle to resolving the conflict and bringing peace. So the administrative process that had begun years before, during David Trimble’s time as First Minister, was continued. This was a normal criminal-justice process, albeit given new impetus, because the clock was running down on the opportunity for a deal. The scheme was actually much less wide-ranging than the legislation would have been, because it could only deal with people against whom a police investigation had demonstrated that there was insufficient evidence to prosecute. As for the accusation that all this was “secret”, the record speaks for itself. I told the Commons on January 11 2006 that the government still believed the “on the runs” anomaly would “need to be faced at some stage” to take the peace process forward. John Reid, a predecessor as Secretary of State, had told the House much the same thing. In a reply to a parliamentary question on July 1 2002, he summarised the process. In January 2009, it was spelt out again in an official report by Lord Eames and Denis Bradley. It explicitly flagged the fact that around 200 individuals had been processed by the police and the Public Prosecution Service by that stage. 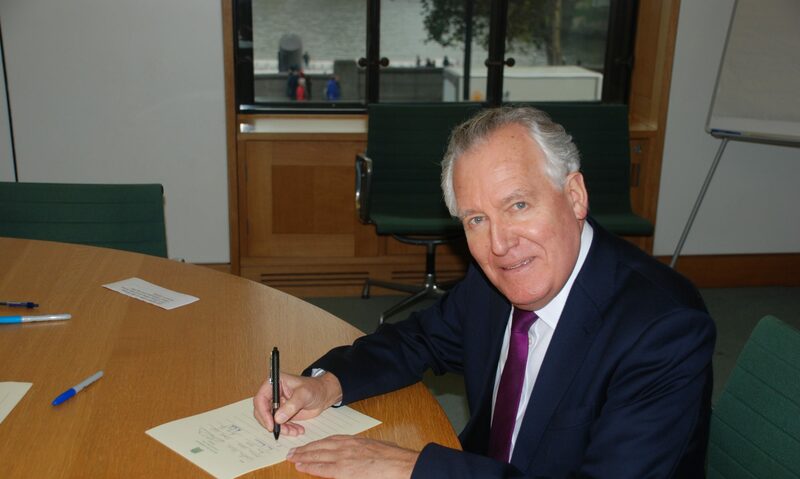 In his memoirs, based upon his contemporaneous diary, Tony Blair’s chief of staff, Jonathan Powell, stated that he had informed both current First Minister Peter Robinson and the Democratic Unionist Party parliamentary leader Nigel Dodds; they were to pass this on to Ian Paisley. They were able to live with it, since the whole process had begun way back when David Trimble was leading the peace process from the Northern Ireland side. There is no suggestion that the contents of the letters to those “on the runs” were cleared with key politicians of all parties, or the details of the scheme shared, but the idea that they did not know anything about them is risible. Even when the letters were in the public domain, there was still misrepresentation, whether wilfully or not, about what the letters sent between 2001 and 2012 actually said and meant – and this process caused the victims even greater pain. Getting an agreement to end the terror and evil over Northern Ireland was tortuously difficult. It involved deals with all sides, some necessarily exclusive to them and not shared at the time. For instance, in a “secret side deal” (to borrow the rhetoric of the past few days), I appointed an Interim Victims’ Commissioner in autumn 2005, at Ian Paisley’s express request, and that caused a furore among other political parties. Although obviously very different to the toxic “on the runs”, both were essential to the ultimate success of the negotiations. Operating in that way would not be appropriate and certainly not right in a normal society like that of England, Wales or Scotland. But this was a deep and vicious conflict going back generations, even centuries. And taking difficult decisions to make political progress in Northern Ireland was not unique to Tony Blair’s government. Margaret Thatcher had signed the 1985 Anglo-Irish Agreement that was hated by Unionists, and she was roundly attacked for “treating with Dublin”. It was John Major who began the engagement with the IRA that would ultimately lead to the Good Friday Agreement, and he was attacked for that just as our government has been. But, because he was right, he had the support of the then Labour opposition, in the spirit of a bipartisan endeavour. That is why David Cameron, his Secretary of State and Attorney General continued to operate the scheme, their officials sending letters like the one to Downey to another 38 republicans. Resolving the issue of the “on the runs” was absolutely essential in order to make progress in Northern Ireland. Without that, I do not think we would have arrived at the situation when, on my watch on July 28 2005, the IRA declared a historic end to its war. Or the subsequent decommissioning of the IRA’s arsenal. Or, crucially, Sinn Fein’s agreement in 2007 to support policing and the rule of law, with the backing of IRA cadres, which opened the door to seven years of relatively stable shared government by bitter old enemies. But, as recent controversy and political grandstanding has confirmed, I remain of the view that Northern Ireland looks over its shoulder too much at the past, rather than to the future. It is time – as the Eames-Bradley report and the recent one from American interlocutor Richard Haas have compellingly argued – to find a comprehensive and inclusive way to deal with the past. Northern Ireland has escaped from the conflict, but is still trapped by its leftovers. Hard as it is for victims on all sides, I see no point in endlessly searching for evidence of crimes committed so many years ago in the Troubles, which is increasingly difficult to get, given the passage of time. Ironically, given our very public past differences, I am with the Attorney General for Northern Ireland on this point. And if we are going to draw a line on historic and, in all probability, fruitless investigations, that must include the pursuit of soldiers involved in the Bloody Sunday incident. Diverting police time to investigate Bloody Sunday soldiers or crimes from the Troubles seems a waste when the priority today should surely be tracking down the tiny, but dangerous, attacks from dissident IRA groups, as well as facilitating ordinary, plain community safety. Meanwhile, let us never forget just how far Northern Ireland has travelled. Instead of evil and horror, there is now peace and stability. It was hard-won and must not be allowed to slip because of this controversy. I welcome the Prime Minister’s statement on a review of the operation of the “on the runs” scheme to make sure no other errors were made, and First Minister Peter Robinson’s subsequent stepping back from the brink. None of us on the government side have anything to hide. We acted honourably throughout. The peace settlement we delivered was designed to ensure that there are no more victims like those of Hyde Park. But settling old political scores at the expense of that process will serve no victim.